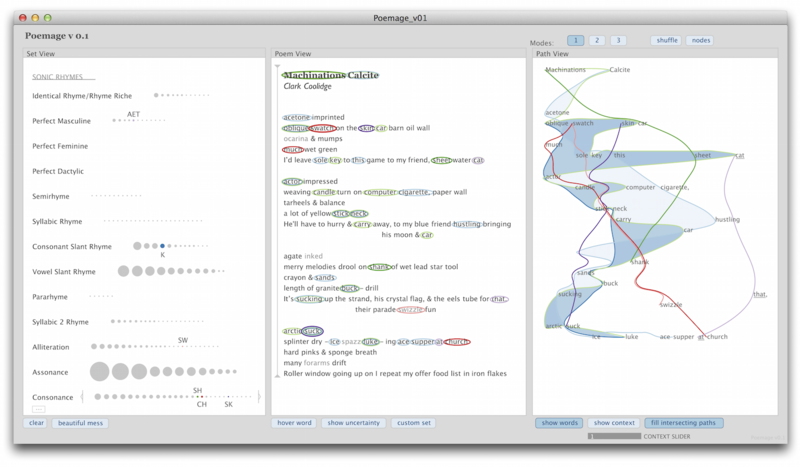 Poemage is a visualization system for exploring the sonic topology of a poem. We define sonic topology as the complex structures formed via the interaction of sonic patterns — words connected through some sonic or linguistic resemblance — across the space of the poem. Poemage was developed at the University of Utah as part of an ongoing, highly exploratory collaboration between data visualization experts and poets/poetry scholars. Additional details are provided in the companion paper . Poemage is open source. Please check back periodically for updates. Executables are no longer supported. Please check back soon for a web version of the tool. If you would like to be notified when the web version is up and running, please send email to nina@cs.utah.edu. As part of this collaboration we have also developed a system, called RhymeDesign, for querying complex rhyme in a poem. RhymeDesign provides the back-end for Poemage. For more information about the system, and to download the application/source, please visit RhymeDesign.org . N. McCurdy, J. Lein, K. Coles, M. Meyer. Poemage: Visualizing the Sonic Topology of a Poem. IEEE Transactions on Visualization and Computer Graphics (Proceedings of InfoVis 2015), pages 439-448, January 2016. K. Coles. Slippage, spillage, pillage, bliss: Close reading, uncertainty, and machines. Wester Humanities Review, pages 39–65, Fall 2014. J. Lein. Sounding the surfaces: Computers, context, and poetic consequence. Wester Humanities Review, pages 84–109, Fall 2014. N. McCurdy, V. Srikumar, and M. Meyer. Rhymedesign: A tool for analyzing sonic devices in poetry. In Proceedings of Computational Linguistics for Literature, 2015. N. McCurdy. “The Poemage project: exploring the true value of computation to poetry scholarship.” DH U1: The First Utah Symposium on the Digital Humanities. Utah Valley University. Orem, UT. Feb. 2016. K. Coles and N. McCurdy. Developing and Sustaining Collaborative Research in the Humanities. Panel Discussion. MLA2016. Austin, TX. Jan. 2016. K. Coles. “I Don’t Care About Data.” Data-Driven Research in the Social Sciences and Humanities—Increasing Research Potential through Interdisciplinary Working. Panel Discussion. “Round Three” Digging Into Data Challenge Conference. Glasgow, UK. Jan. 2016. K. Coles. “Ghost (in the) Machine.” Melbourne. Oct. 2015. K. Coles. “Poetry and Exploration: In Motion in the Machine.” Canberra. Oct. 2015. N. McCurdy, J. Gonnering Lein, A. Hurtado. “Deep in Poetry: Improvisations in Tech, in Text, in Time.” IEEE VISAP2-15. Chicago, IL. Oct. 2015. N. McCurdy. "Visualizing the Sonic Topology of a Poem.” IEEE VIS . Chicago, IL. Oct. 2015. J. Gonnering Lein. Computers in my Classes: A Pedagogy Round-Table on Workshopping (With) the Digital. Panel Discussion. AWP2015. Minneapolis, MN. April 2015. N. McCurdy. “Visualizing the Sonic Topology of a Poem.” CRA-W Grad Cohort Workshop. San Francisco, CA. April 2015. Poster presentation. J. Lein. “Digital Humanities and Dickinson’s ‘Tell’: Recounting Poetic Encounter.” New Work on Dickinson: Flash Talks. Modern Language Association. Vancouver, BC Jan. 2015. K. Coles and J. Lein. Turbulence and temporality: (re)visualizing poetic time. Things my computer taught me about poems. In MLA2014. Chicago, IL. Jan. 2014. Nina McCurdy, Doctoral Student. School of Computing, University of Utah. Julie Gonnering Lein, Postdoctoral Fellow. Department of English, University of Utah. Katharine Coles, Professor and Director of Creative Writing. Department of English, University of Utah. Miriah Meyer, Assistant Professor. School of Computing, University of Utah. This work was funded in part by NSF grant IIS-1350896 and NEH grant HD-229002. Please contact nina@cs.utah.edu with feedback.